Some family and friends of mine are experiencing the title of this post literally as they face their second week of life away from Target corporate here in Minneapolis. I stocked up on Target goods late last week, but something just didn’t feel right. I met with my cousin who was laid off, and her dad, my uncle, expressed the same thought – we are no longer Target shoppers. Target has lost its luster due to the recent layoffs, but they were on the decline to me because of product. I would often settle for certain food items because I was already at the store and didn’t want to make a trip to the grocery store too. This led to some poor nutritional decisions, which is not good, no matter how much money you save. My impressive Cartwheel savings app stats are due to me putting all of my eggs (diapers, soap, and coffee) in one basket. I chose to shop at Target nearly exclusively for my family’s food, toiletries, and more. I even signed up for the Red Card to get 5% off each purchase. In one year, I “saved” over $500 with that 5%! Already this year, I’ve “saved” over $300. Maybe I just need a project, a goal, or something to gamify my shopping experience. Sometimes, food and toiletry shopping is the only time I get out of the house truly alone without a toddler in tow, so it’s important to keep it fun. 1. 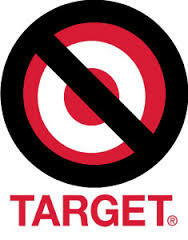 No more Target. I erased all Target-related apps from my Red Card will be canceled and shredded. I think this will result in some savings due to eliminating those infamous Target impulse buys of clothes, shoes, and home accessories. 2. Buy groceries at “real” food stores. There is an amazing food co-op, bakery, and butcher within less than a mile from my house. There’s a beautiful grocery store nearby where I can order online and drive-through to pickup my groceries! Even though it’s snowing outside, farmer’s market season is here! 3. Buy toiletries at CVS. You guys, if you didn’t know already I am a huge lung cancer awareness advocate. Did you know that CVS stopped selling tobacco and cigarettes?? Well, if you think that is cool, please support them. They also recently revamped their app to link their coupon e-mails with your ExtraCare card. This means you just click a button on your email and coupons are added to your card. There is also no need to scan your ExtraCare card at the kiosk in the store to get paper coupons – just present your card to the cashier when you check out, all of your coupons are there! 4. Buy (some) toiletries through Amazon Subscribe and Save. This is a great program for things you buy in bulk like toilet paper, paper towels, diapers and wipes. I also have found that the dog food I prefer for my pup is WAY cheaper through Amazon, plus I don’t have to lug all 25-pounds of it to and from my car. SCORE. 5. Continue to clip coupons. Heck, maybe even buy a Sunday paper once in awhile for the excitement of the P&G Brandsaver or extra RedPlum inserts! I also like using coupons.com. 6. Perhaps, just perhaps, further gamify my shopping and venture into the world of coupon apps like Shopkick, Ibotta, Receipt Pal, and others. Last year, it seemed like too much for me, but maybe without Cartwheel in my life, there’s room for these apps. I have friends that have really saved money this way. Is anyone else quitting Target? Do you have money-saving tips that I did not mention? I’d love to hear from you!